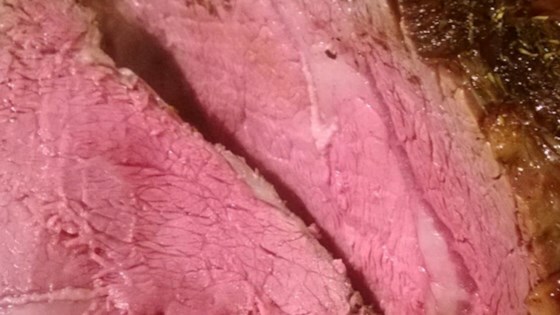 "The best rib roast you'll ever have, perfectly pink from edge to edge. It takes some time, but well worth the effort." Sprinkle salt over entire roast and wrap with plastic wrap. Refrigerate, 4 hours to 24 hours. Combine olive oil, black pepper, garlic powder, rosemary, thyme, onion powder, paprika, and cayenne pepper together in a bowl. Set aside for flavors to blend, at least 1 hour. Pour most of the oil mixture over the roast and massage into the top and sides of meat. Flip the roast and pour remaining oil mixture over roast and massage. Place roast on a plate and refrigerate, 1 hour to 12 hours. Preheat smoker to 225 degrees F (110 degrees C) to 230 degrees F (107 degrees C). Add hickory or pecan wood chips to smoker. Insert an oven-safe meat thermometer into the thickest part of roast. Place roast into the smoker and roast until internal temperature reaches 145 degrees F (63 degrees C), 3 to 3 1/2 hours. Preheat an oven to 500 degrees F (260 degrees C) to 550 degrees F (288 degrees C). Bake the roast in the preheated oven until crust is crunchy, produced a reverse sear, 15 to 20 minutes. Allow roast to rest 10 to 15 minutes before slicing. Do not use a roasting pan and a V-shaped rack. Doing so will block the airflow around the lower third of the meat resulting in under-cooked meat and a soggy crust. If you want to save the juices for an au jus, place a pan on a lower shelf or place a flat roasting rack on top of the roasting pan. If your guests prefer a more well-done slice, heat some beef broth in a frying pan to boiling, reduce heat to a simmer, and place the slice of roast in the pan for about 30 seconds; flip and cook for another 30 seconds. But you will lose the gorgeous pink color. Use 1/2 teaspoon salt per pound of roast for salting. You can also smoke the meat on a grill using hickory or pecan wood. Turn grill up to highest temperature to do the reverse sear. for the sauce I mixed about 1 cup sour cream 1/3 cup horse radish 1 teaspoon Worcestershire and one teaspoon fresh lemon. Best I ever had and I will be making it again soon. 145 is way too long for a med rare prime rib. Smoked to 120 IT, oven at 500 for 5 min or until crust is formed. Rested for 25 min, sliced and served. I cooked a 2.5 lb roast and the flavor was perfect but next time I will reduce or eliminate the oven time as I like my meat pretty rare. I did 10 minutes in the oven it was overcooked for me.